546 pages, 1 page front cover (by Wayne Reynolds), 1 page editorial, 3 pages of editorial, 1 page ToC, 1 page dedication, 5 pages of advertisement, 1 page back cover. That leaves 534 pages. It’s been a long time since Razor Coast has been released and there’s a reason my review took this long. First of all, let me preface this with a disclaimer: I can’t, by any means, be truly neutral regarding Razor Coast. I just can’t. you see, there would be no Endzeitgeist without this book. It was Razor Coast that made me excited enough about a book to actually end my online abstinence and register at Sinister Adventures back in the day. I didn’t even have a Paizo account. I had no idea Rite Publishing or Open Design even existed. Without this book, NONE of my reviews would have ever been written. Without it, none of the friendships, none of the kind people would have ever entered my life. I was stunned by the kindness of Nick and Lou and then…Sinister Adventures went down. My heart bled, I raged, I reasoned…all the steps of grief, as pathetic as that may sound. I never ordered a refund. I waited. When Frog God Games took Razor Coast and uploaded the KS, I thought “NO WAY” – why? Because the funding goal seemed insane. The requirement to commit 30-buck preorders from back in the day, get new artwork etc. blew up the goal and you can’t begin to understand the amount of exhilaration I felt when it funded…with flying colors, reaching all those stretch-goals. I couldn’t believe it. At this point, not only had Razor Coast’s prior vapor ware status been the grain of sand that was in the center of my decision to go reviewer, it had amassed such a n epic level of expectations, I started dreading the arrival of the massive tome (#213, btw.!) and all the bonus books I went for via the KS. Then, I started reading it. And from a reviewer’s perspective, I was looking at a problem of no small proportions – Razor Coast seems to defy proper reviewing. Usually, when I take a look at a module, I take a look at the plot, hooks etc. and then give you a synopsis of what to expect, try to analyze issues with the plot etc. Alternatively, a sandbox gets a similar treatment, but more free-form. Well, Razor Coast refuses to fit in either mold. So what is this monster’s structure? We have inciting incidents, that kick off a given arc – two massive major plot-arcs suffuse this tome. These are supplemented with vignettes, set-pieces and stand-alone encounters as well as relationship subplots. These are here, and in the end, it’s up to DM and players to decide in- and outgame which/what to pursue. Essentially, Razor Coast tries to combine the free-form modularity of a true sandbox campaign with the plot-driven structure of an AP. Now, usually, I’d just give you a run-down of the general plot-structure – that doesn’t work here. If I were to list everything herein, this review would probably be as long as all my Slumbering Tsar-reviews combined. So instead, I’ll tell you about what can be found herein: First of all, there would be indulgences, i.e. Sinister Adventures’ small pdfs, converted to the PFRPG-ruleset. This means that Craig Shackleton’s dueling rules, including the bind combat maneuver, have been updated. These are intended to essentially make the swashbuckler a more valid option char-build wise and if used as intended for low-armor, dex-based fighter, makes sense. The thing is, the feats aren’t particularly weak and while not per se broken, e.g. treating a one-handed piercing weapon as a reach weapon can be broken badly – enlarge character, magus levels etc. At prereq BAB +1, too easy to abuse, also thanks to the feat not requiring an explicit action, thus making it possible to combine this with other feats. Then again, the parrying rules per se are solid and have seen some use in my game. The Tulita-ethnography comes the throw maneuver (which feels unnecessary) and also some feats, one of which isn’t as broken as it was in 3.X, but fixing unarmed threat range at 18 sans following usual rules of threat range enhancements would be bound to lead to confusion. The Mai’kal archetype gets a somewhat broken ability at 15th level, allowing them to, as an immediate action, reverse an attack on the adversary 1/round as an immediate action for 1 ki point. The essay on underwater adventuring contained here is also nice, though after the release of both Sunken Empires and Alluria Publishing’s glorious Cerulean Seas, there are better options. But you don’t want me to pick this one apart crunch-wise, do you? The adventure is what counts, so what can I say about it before I go into spoilers? Let’s give you an overview – the Razor Coast is a tropical paradise, though not one sans its dark past. The native population, the Tulita, lived in relative peace until colonialization began and the white/yellow/black/whatever men came and defeated them handsomely. Now, the once sacred whales are hunted, the eggs of the venerable turtle smashed and colonial ignorance has erected Port Shaw, a thriving port on sacred ground. Dark days have found the paradise in peril, as racial tensions rise and evil conspires above and beneath the waves. Here, one thing should be noted – the writing is superb. In a genre, where Freeport and Sasserine constitute two very iconic settlements with their own flavor, making a given age of sail-style settlement stand out is quite a feat and neither settlement would be confused with Port Shaw (though they probably could replace it with some work) -the writing makes the settlement, the whole coast really, come to life from the pages. immersion is also increased via the entries on e.g. deities in the appendix. Oh, have I mentioned that5 thanks to a collaborative effort with Green Ronin, the book actually offers information on how to handle both Freeport and Port Shaw in the same setting and how they geographically relate? Yes. Awesome. Now beyond the leitmotif of colonialism and the resulting racial tensions and cultural warfare, we have a leitmotif of progress vs. nature in the guise of colonial powers destroying natural resources and killing essentially the sacred animal guides of the Tulita. This topic per se is rather subdued, though its presence can be felt in one of the main plots, but more on that later. Now I’ve mentioned relationship subplots – and these deserve the moniker. 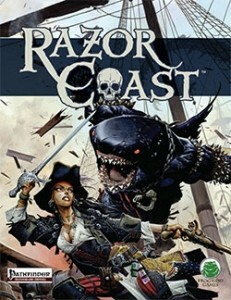 Essentially, Razor Coast is as character-driven and NPC-rich as you want and a former band of heroes, down on their luck and destined for an inglorious downfall, is provided in excruciating detail – these beings are characters in the truest sense of the word and while they all have been broken, the PCs have a chance to mend them. The same btw. holds true for the legendary widow of Captain Razor and even some antagonists – overall, indifference will lead to depressing ends indeed, while invested PCs can truly make a difference and save those souls from the abyss into which they gaze. If you’re like me and read these, you’ll probably recognize yourself or some of your friends n their darkest hours in these NPCs – yes, they’re that detailed. So if your PCs are big on the ROLE of roleplaying, Razor Coast provides ample potential. Essentially, colonialism and the killing of animals has helped dread shark-god Dajobas and his chosen to return to shore. Dread were-sharks have infiltrated Port Shaw and expect to hold a massive feast of carnage and death in its streets. Furthermore, the legendary kraken-fiend has all but taken control of Port Shaw via a secret society and plans to soon reap the city. Then former plot is conspiracy 1, the second one no.2 and both make for linear, rather epic (apocalyptic, even!) scenes – within the modularity of the vast tome, these stories are what drives the meta-plot. And yes, they’re infinitely more complex, tied to x characters, strange islands, sunken treasures, betrayals long past etc. And yes, in order to not bloat this review beyond 20 pages, that’s all you’ll be hearing from me regarding the plot(s). Soooo…those plots and all the encounters, flavor etc. need to be organized. The tools are there. Before we go into that, another caveat, though – look at the end of the book. Among the indulgences, several mini-modules await and the book also features essentially what can be considered an additional Voodoo-themed adventure that is completely optional. These are NOT part of the main-book’s outline, nor are the modules from the expansion “Heart of the Razor”, though the latter help with levels in which the main material is a bit less versatile than one would expect. It should also be noted that the appendix features new creatures galore, including, yes, undead cannibal pygmies (and their unliving totems! ), a race of degenerate Cyclopes, drugs, items both mundane and magical and much, much more. Have I mentioned the hand-out driven puzzle/treasure map, options for underwater adventuring etc.? Editing and formatting are surprisingly good for a book of this length – while there are glitches in here, they are relatively few and far in-between. Layout adheres to a parched-map-style full-color 2-column standard that is easy to read. The respective full color artworks are universally drop-dead-gorgeous and the maps are as well. While some maps have the scaling-numbers slightly pixelated, the maps themselves are plenty and beautiful. Furthermore, the map folio offers player-handout-style maps of the respective areas herein, adding for me tremendously to their use. The massive tome comes fully bookmarked with nested bookmarks for your convenience. The pdf’s artworks sometimes feel a bit less high-res than those present in the hardcover – if you can, I’d definitely suggest going for the full-color dead tree tome. Printing this would probably cost more in ink/toner than just getting the book anyways. There’s another reason for this – you’ll need post-its. Seriously. A metric ton of post-its. I have a very good memory, but still – running this behemoth will require you to have a lot of things at your fingertips, even with all the help the book tries to give you. Which also brings me to the reason why this took forever – first of all: Novice-DMs need not apply. Sorry. Even for me, who considers running modules of ZEITGEIST-complexity easy, with years of sandboxing campaign information, this is a rather complex endeavor. The best advice I can give is to read the whole book. At least twice. Which won’t be an issue, since the respective areas are full of iconic encounters, compelling characters and superbly dark, gritty, nail-biting climaxes. The writing is superb and just glorious. It should also be noted that the shades-of-grey themes actually are there – while the Tulita generally are pictured as the good guys, there are ample exceptions and only scarcely does the book stoop to painting a clear b/w-contrast. When it does, though, it MAY be slightly jarring – the whole book essentially portrays the process of colonialization in all its violence and despicable facets. Indigenous population under control via drugs? Yes. Cultures destroyed? Yes. Slavery? Yes. There are not much saving graces for the powers that be here and thematically, that is the only narrative weak spot in an otherwise surprisingly versatile plot. While the book actually manages for the most part to maintain complex moralities and shades of grey in all protagonists and even in some of the more despicable antagonists, when it comes to the Tulita, it sometimes reverts to simple b/w: Portraying them in a very much romanticized noble savage-way. I’m been discriminated against and personally, it’s probably this experience that makes me consider this to be, in its way, just as problematic as a demonization of a given people. In any other setting/module, I wouldn’t have complained here, but in the gritty, surprisingly deep Razor Coast, this feels a bit off at times, especially due to generally, the depiction maintains an enlightened, non-glorifying stance. But then again, perhaps that’s just the cultural studies mayor talking. To let me make this abundantly clear – this is NO white guilt-trip, theme-wise, but it also falls, by a margin, short of what it could have been in that regard. It took me some time to analyze what made this, at least in my perception, harder to run than e.g. Slumbering Tsar and similar massive campaigns. The reasons are twofold: For one, the massive tome shoots itself somewhat in the proverbial foot by noting several sample motivations à la “Champion of the Tulita”, “Allied with the Powers that be” etc. IGNORE THESE PREMISES. While one could craft a Razor Coast-campaign with these themes, the overall narrative is imho neutered by trying to shoehorn it into one of these adventure-path-like premises. Essentially, the whole of the book does not particularly support these themes. Yes, they’re there, but looking for them and trying to jam the sandbox into that frame tremendously hurts the experience and limits players/could lead to a less versatile experience for them. The support for these pseudo-AP-motivations is just not pronounced enough and I’m of the conviction these hurt the book more than anything else. So, again: Ignore those. Secondly, the organization of the massive material is more confusing than it ought to be – the “build-your-own-AP”-section with all its checklists and help doesn’t help that much – or at least, it didn’t help me. Why? Because it lacks the supplemental material, even from the same book. Tying indulgences and “bonus-storyline” (and Heart of the Razor) into the whole would have made this section much more useful. Another issue would be that you first get Port Shaw, then the Key-NPCs, then the planner and then the encounters/meat of the book. Essentially, the planner is talking about things, which, if you read this in a linear way, you haven’t read and have no clue about. So if you start reading, skip this section and return after reading. While this isn’t bad, it also makes preparing this behemoth more challenging, at least at first sight, than it ought to be. Much of the problems simply dissipate if you just read the meat of the adventure, the setting-information etc. and start planning for yourself. One of the reasons some people experienced a slight backlash here, can be explained via the tremendous expectations associated with this tome, while others lie primarily at the problematic organization. This book would have imho fared better by sticking to a sandbox-presentation and then just add a generic time-line and insert encounters into that. Just my 2 cents, of course. Endeavoring to make this both an AP and a sandbox ends up unnecessarily complicating this. Now all of this sounds awfully negative – and it shouldn’t, let me make abundantly clear that this is a rite-of-passage-style monster-tome to separate the men from the boys, DM-wise. It’s challenging (Though not Frog God Games-hard.) and ultimately a great module that takes cultural cues otherwise scarcely, if at all, explored and provides a rich, fun, dark and at times downright evil setting that oozes unique style and flair, provides superb writing, ideas galore and more potential for fun than MANY collective modules/APs of similar length. Is it for novice-DMs? Hell no. Is it polarizing? Yes. Is the crunch universally awesome? Nope. But does this belong into every PFRPG-DM’s library? In my opinion, yes. Razor Coast is a gloriously wicked tome, superbly written and while it is not perfect, I don’t regret a single cent I’ve spent on it. (And yes, I went all-out on the KS.) Is it the perfect tome of superlatives that years and years of expectations painted it in, in many a mind around the globe? No, but it honestly couldn’t have been. What it is, is a great mega-adventure in a unique setting, full of unique, interesting characters and a living piece of PFRPG-history, a mega-adventure your players WILL keep talking about for years to come. And while it didn’t make my Top Ten-list of 2013, it came damn close, by virtue of its originality, scope and ambition, by its narrative clout and the hard work of Nicolas Logue, Lou Agresta, Tim Hitchcock, John Ling, Ton Knauss, Frank Mentzer, Richard Pett, Craig Shackleton, David Posener, Greg A. Vaughan, Adam Daigle, Wolfgang Baur and Brendan Victorson. To me, this tome is still 5 stars + seal of approval must-have material. It may not be perfect, but it is different, ambitious and downright evocative. And we need more books of that caliber, that take chances with something different, both in form and ambition. Oh, and if you’re an experienced DM, you’ll be hard-pressed to find a given module to better show off your skills – in the hands of one, this vision will come alive in all its blood-drenched, tropical glory. You can get this monster for PFRPG here on OBS and here on d20pfsrd.com’s shop. If you’d rather go old-school, there also is a Sword & Wizardry-version here on OBS and here on d20pfsrd.com’s shop.